Previous post in this series: Discovering SCP Workflow – Service Proxy. Now that we’ve covered how to kickstart a workflow instance, It’s time to look at the overall picture of what we’re building. It’s a relatively simple process backed by a three-step workflow definition, which contains one each of the three different task types (user, script and service). I can’t imagine this process being particularly useful in the enterprise, but then again, I created it for fun, to help my learning journey, and to be about stuff I’m interested in – stats and info about craft beer. What’s not to like? Like many of my friends and colleagues, I’m a fan of craft beer as well as someone who likes building with data and putting new technologies through their paces. Untappd is a place where like-minded folks record (via ‘checkins’) what beers they’re drinking, rating and describing them, sending toasts and comments to each other, and generally having a pleasant time enjoying socialising with good brews. Crucially there’s an API that offers access to the rich seam of data that is being gathered, on checkins, beer ratings, breweries, venues, users and so on. 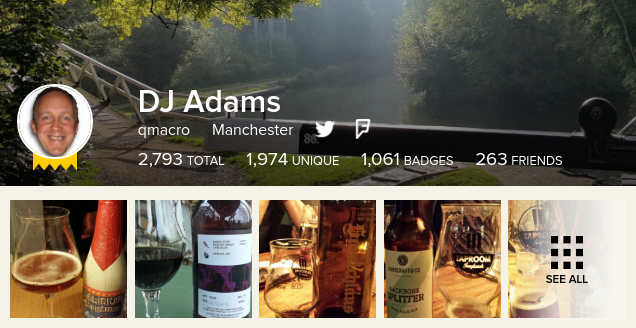 I’m always on the lookout for new beers, and to improve my stats, because, well, badges! So the general idea is to monitor what beers I check in, and then provide me with a selection of similar beers for me to choose from; those I choose end up on a wishlist of sorts, for me to use as a reference on future purchases. This process is to run exlusively in the cloud. So the landscape consists solely of platforms that are cloud based. 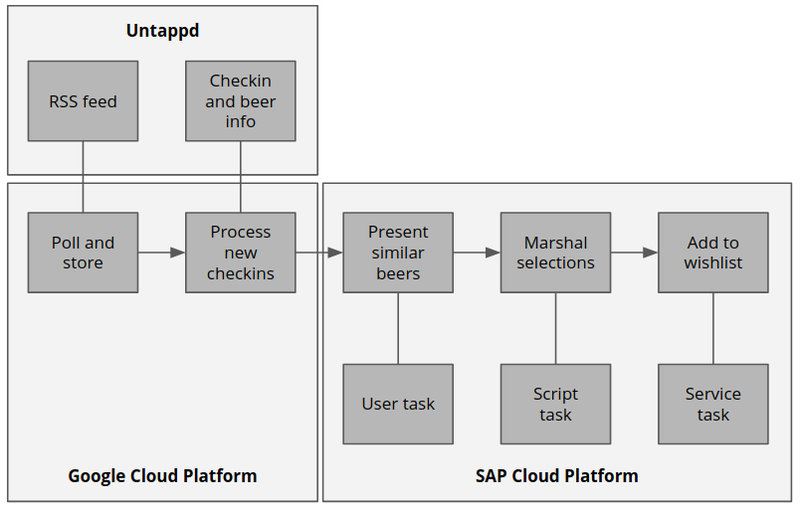 The Untappd API itself of course is “up there”, and if you’ve read the previous post in this series, Discovering SCP Workflow – Service Proxy, you’ll know that the solution spans the Google Cloud Platform (GCP) and the SAP Cloud Platform (SCP). Here’s a high level schematic showing the parts of the solution. Of course, with the SAP and Google partnership moving ever closer, it’s an ideal complementary platform to SCP. This is done on a regular basis with time-based triggers (think cron for your scripts in the cloud), using various core services such as the script service UrlFetchApp and the G Suite service SpreadsheetApp. In the previous post we looked at what then happens – the script initiates a new workflow instance on the SCP Workflow service via the service proxy cloud function. Present similar beers – this is a task that involves a human (me) to be presented with information and to make a decision, for the workflow instance to move on to the next stage. The appropriate task type in the workflow definition for this is a User Task. Add to wishlist – the marshalled data is sent to a remote service which stores the selections in the wishlist. This is done in a Service Task, which connects to the remote service via SCP’s Connectivity Service. You and me would probably say “via a destination”. It isn’t by accident that the three steps in this process exercise each of the three types of task – I wanted to create something that caused me to use each of them. Of course, future iterations of this solution design might move some of the processing from GCP into SCP, as further steps in the workflow definition. But for now this will do nicely. Let’s take a look at the workflow definition model. Each task’s type is denoted by the icons in the top left corners – user, script and service respectively. I must say, I found the editing of the workflow definition in the Web IDE went very well. In the next few posts in this series, I’ll dive deeper into each of these tasks as defined for this solution, including a little bit of how they’re defined in the editor. The next post will cover user tasks in general, and start to look at the “Present recommendations” script task in particular. Next post in this series: Discovering SCP Workflow – User Tasks. Cool use case – looking forward to the next posts!